What Is an AI File? 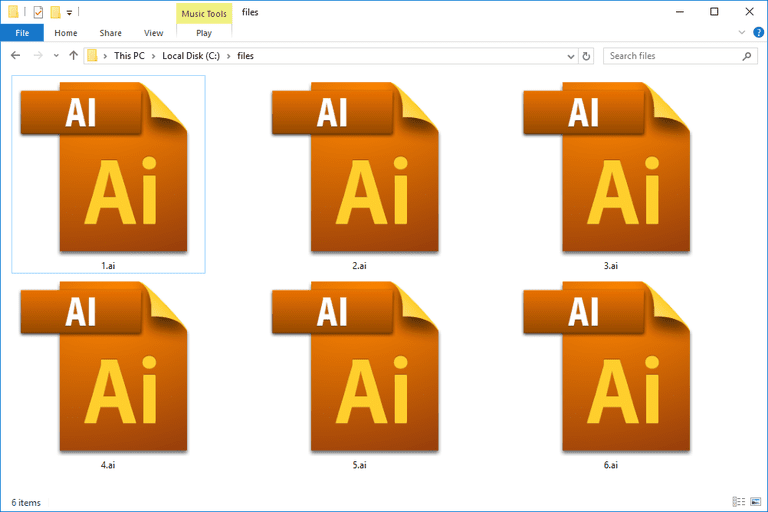 A file with the .AI file extension is most likely an Adobe Illustrator Artwork file created by Adobe's vector graphics program called Illustrator. It's a proprietary file format developed and maintained by Adobe Systems. Instead of using bitmap image information, AI files store the picture as paths that can be resized without losing quality. The vector image is stored in either the PDF or EPS format but the AI file extension is used since the Adobe Illustrator program is the primary software that creates files in this format. AIT files are similar but are Illustrator Template files used for making multiple, similarly designed AI files. If your AI file isn't an Adobe Illustrator Artwork file, it might instead be a Battlefield 2 Artificial Intelligence file. If so, it has nothing at all to do with vector images but is instead a plain text document that holds the properties for how certain game elements work. AI, of course, is also the common abbreviation for the concept of Artificial Intelligence, which of course has nothing specific to do with Adobe Illustrator. Adobe Illustrator is the primary program used to both create and open AI files. Some other applications that can work with Adobe Illustrator Artwork files include Adobe's Acrobat, Photoshop and After Effects programs, CorelDRAW Graphics Suite, ACD Systems Canvas, Serif DrawPlus and Cinema 4D. If the AI file doesn't have PDF Content saved within it, and you're using Photoshop to open it, you might get a message that says something like "This is an Adobe Illustrator file that was saved without PDF Content." If this happens, return to Adobe Illustrator and make the file again but this time choose the "Create PDF Compatible File" option. Some free AI openers include Inkscape, Scribus, ideaMK's Ai Viewer and sK1. So long as the AI file is saved with PDF compatibility, some others include Preview (the macOS PDF viewer) and Adobe Reader. Battlefield 2 is used to open AI files associated with that game but you probably can't open the file manually from within the game. Instead, it probably resides somewhere special so that the software can refer to the AI file on an as-needed basis. That said, you can most likely edit it with a free text editor. The AI openers from above can convert an AI file to a number other similar formats. Use Illustrator's File > Save As... menu to to save the AI file to FXG, PDF, EPS, AIT, SVG or SVGZ, or File > Export... if you want to convert AI to DWG, DXF, BMP, EMF, SWF, JPG, PCT, PSD, PNG, TGA, TXT, TIF or WMF. Photoshop lets you open an AI file through File > Open..., after which you can save it to PSD or any other file format supported by Photoshop. However, if you don't want to buy or download a dedicated AI file viewer, you can still convert it with an online AI converter like Zamzar. With that website, you can save the AI file to JPG, PDF, PNG, SVG, GIF and a number of other image file formats. Some programs can only open AI files that are older than a certain version. For example, the free Inkscape program can import AI files that are based on the PostScript AI format so long as the version is 8 or below, while PDF-based AI files version 9 and newer are supported. The AI format used to be called PGF but is not related to the Progressive Graphics File format that uses the .PGF file extension. The .AI file extension is really short and contains two very common letters. This makes it easy to confuse it with other similarly spelled file extensions that have nothing to do with either Adobe Illustrator or Battlefield 2. AIR is another example, as is the INTUS Audio Archive format that uses the IAA file extension. Neither of these file formats has anything to do with formats that use the AI file extension. However, yet another example is AIA, and this one can be a little confusing. This file extension might be used for MIT App Inventor Source Code files used with MIT App Inventor or it might actually be an Adobe Illustrator Action file that's used to automate steps in Adobe Illustrator.